Starting in the fiscal year ending March 2015, the Industrial Inkjet Business has been changed from the Other segment to the Business Technologies Business segment from the first quarter of the current fiscal year. 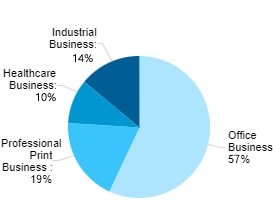 Starting in the fiscal year ending March 2013, the reportable segments are the Business Technologies Business, Industrial Business, and Healthcare Business from the first quarter under review, instead of the Business Technologies Business, Optics Business, and Healthcare Business, which were reportable segments until the previous fiscal year. Major products and type of services were also changed. Manufacturing and sale of optical products (pickup lenses, etc.) and electronic materials (TAC films, etc.) as in the Optics Business were changed to manufacturing and sale of electronic materials (TAC films, etc. ), performance materials, optical products (pickup lenses, etc. ), and measuring instruments for industrial and healthcare applications as in the Industrial Business. Meanwhile main products and type of services both in Business Technologies Business and Healthcare Business were not changed. 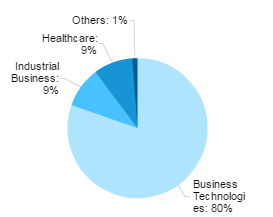 Starting in the fiscal year ending March 2011, the Sensing Business was included in "Other Business", and the "Business Technologies Business", the "Optics Business" and the "Healthcare Business" will be the three business segments with net sales, operating income and operating income ratio disclosed by business segments.